If your animal companion is exhibiting unusual symptoms of any sort, the first thing I recommend, after you’ve received a clean bill of health from your veterinarian, of course, is to look for issues in their energy field. It is often where the root cause of physical, emotional and behavioural issues resides and once determined, cleared and balanced, your animal companion can return to good health and wellbeing on all levels. Chakras are a main component of the energy field and a perfect place to start. The chakra system holds the key to many imbalances in our animal companions, whether of a physical, emotional, mental or spiritual nature. By unlocking these imbalances, we not only enable them to live in greater comfort and joy, but we can also unravel their untold stories, sometimes even more effectively than through animal communication. At the least, working with the chakras of animals is a huge benefit when it comes to improving their lives. In case you’ve never heard of chakras before, they’re simply energy vortexes or portals, located in various locations throughout the body, spinning and emanating outwards, and are vehicles for the assimilation of vital life force energy. This vital life force energy is filtered through their chakras and their entire being, so when there are imbalances or blockages present, they can inhibit assimilation, resulting in physical, emotional or behavioral symptoms. For simplicity I often liken the chakras to “etheric organs” and feel the health and wellbeing of them can be just as important to an animal as is the health and wellbeing of their physical organs. While I recommend consulting a professional for this, you can also learn to do it yourself. Intuition – if you are intuitive, you can tune in to the energy field and chakras of your animal companion to determine which chakras are out of balance, or contain blockages. 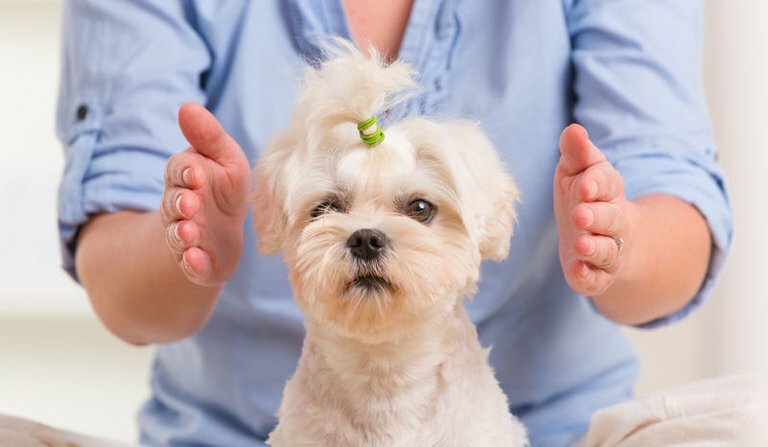 Surrogate muscle testing – if you are skilled at muscle testing (also known as applied kinesiology), you can test your animal companion’s chakras, using a surrogate, or by self-testing, as using one of their muscles isn’t an option. Dowsing – if you’re an adept dowser, you can dowse your dog’s chakras using a pendulum, either right above the body, or using a chakra chart remotely. Be sure to specifically ask for the “energy of the chakra”, as dowsing can measure a myriad of energies. Sensing energy with your hands – another way to determine chakra blockages or imbalances is through your hands. This requires a keen sensitivity to energy which I believe can be learned by anyone, with practice. Once adept, simply hold your hand over the area of each individual chakra to determine any imbalance or blockage. Hands on healing – as the name implies, hands on healing is done by placing your hands on or just above the body, in this case the chakra, and intending that universal healing energy flow to the animal and correct any imbalance. Distance healing – distance healing can be done from a distance of anywhere from a few feet to a continent away from the animal, while intending that universal healing energy flow to the animal and correct any imbalance. Intention – your intention is the most powerful healing tool you have, and all you really need to heal any being. I like to create an intention with an accompanying statement such as “I send green light to Carly’s heart chakra and ask that it come into perfect balance spinning in a perfect fashion, with any blockages, imbalances or non-beneficial energies to be released to the spiritual”. Radionics – radionics is a method of healing by sending particular frequencies to an animal to promote healing. This can be done with a radionics machine, or through your own energy field (with training). Visualization – visualization is another powerful healing tool. You can visualize the chakra coming into perfect balance with all blockages or imbalances being released. Color – you can use the corresponding color of the chakra (E.g. for the root chakra use red) and picture it overlaying and infusing the chakra, and clearing out all imbalances and blockages resulting in a clear, balanced chakra. Crystals – There are a number of crystals that can be used to heal each chakra. For example, amethyst, violet tourmaline or lepidolite resonate with and can be used to balance, clear and heal the crown chakra. A Pendulum – I mentioned above that you can determine an imbalance or blockage in a chakra through dowsing. You can also bring a chakra back into balance using a pendulum. Simply hold the pendulum over the chakra to be balanced, manually swing it in a clockwise circle while sending energy, and continue to do so while intending that it come into perfect balance. Do so until you feel it has. Spirit Animals – this is a more shamanic approach; each chakra has a related spirit animal and you can call in the spirit of the corresponding animal, to come to your animal companion to heal their chakra. Physical Stimulation – weak chakras can be stimulated with various activities such as exercise, bathing, massage, depending on the particular chakra. Humans have seven major chakras but animals have nine. One of the extras being the sensing chakra, which enables your animal companions to see, hear, sense and smell much better than you. The other being the brachial chakra, a main energy center that links directly to all the other chakras in animals. Please Note: Animal Communication and Healing is not a substitute for Veterinary care. Lynn McKenzie is an internationally acclaimed Psychic, Animal Intuitive and Healer. Through her Animal Energy® Certification Training program she teaches others to attune and awaken to the teachings and wonder that all sentient beings wish to share. She can be reached at (512) 827-0505 ext. 8642 or through her website at www.LynnMcKenzie.com.